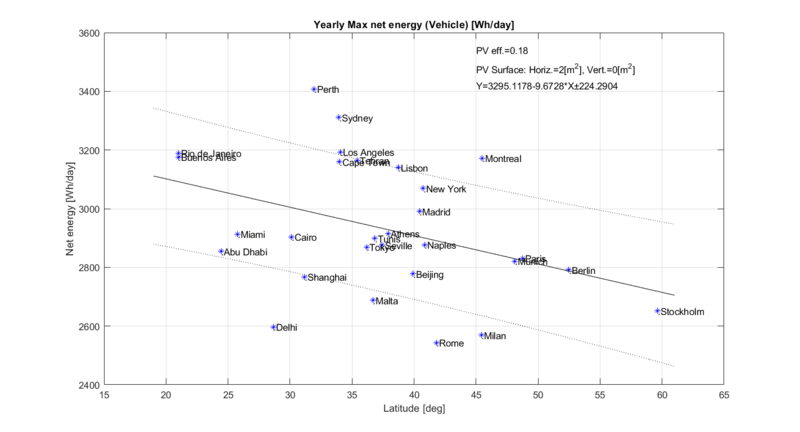 There are important differences between the use of solar energy and all other modes of powering the cars. Solar photovoltaics is the only case in which the primary energy can be used on the car, coming directly from nature, in a sort of “short supply chain”. 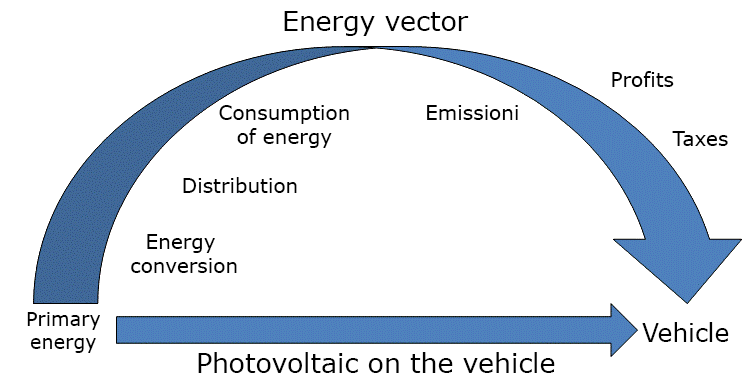 In all other cases, an “energy vector” is used: the primary energy is “incorporated” into a “vector” (fossil fuel, bio-fuel, electricity, hydrogen …), transported, distributed, sold and taxed. It is a relevant difference: in fact, energy transmission always involves energy consumption and, in many cases, CO2 emissions, energy costs and emissions that would instead be avoided by using direct primary energy on the vehicle, through photovoltaics. What contribution can photovoltaics make on a car? Let’s now try to evaluate the savings that can be achieved by integrating the photovoltaic system into a vehicle. 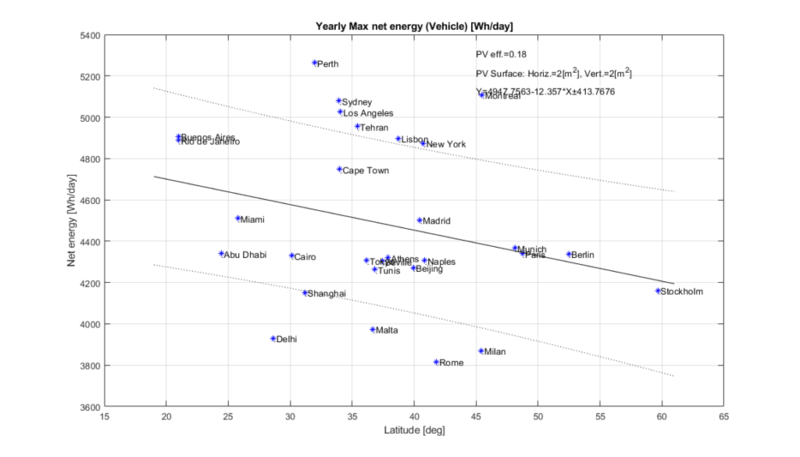 The skepticism that has accompanied the use of solar energy in the automotive field for a long time is due to the fact that the power of a solar panel that can be housed in a car with a normal size, of 300 W, is much lower than the power of a medium-sized car, of the order of 50-60 kW. But this observation is as elementary as it is misleading: it would be correct to think so if both systems always operate at maximum power. In the case of a car, this happens almost only when you run at Le Mans “24 hours”. In reality, most of the motorists (about 50%) use the car mainly in the city, for no more than an hour a day and almost always with only the driver on board. In these conditions, the “average” power required in an urban environment is of the order of 8 kW, considering the partial recovery of the power needed to brake. If the car is used one hour a day, the daily energy required for traction is therefore equal to 8 kWh. Now let’s go back to the solar panel: not even this, of course, always works at maximum power, at least because at night the sun goes away. However, if we consider a panel exposed in a sunny place, the energy obtainable is roughly equal to that obtainable in about ten hours per day operating at a power of 2/3 of the maximum power: in the case of a panel with a maximum power of 300 W , we can estimate the daily energy obtainable on an average day by multiplying the average power (200 W) for 10 hours, obtaining a daily energy of 2 kWh. The photovoltaic panel can therefore provide about 25% of the approximately 8 kWh per day required for traction, in a typical urban use, a value well over 0.5% that an apparently common sense but superficial analysis, based only on the maximum power , he would have attributed to him. The Flexible photovoltaic used in the HySolarKit project is developed by Solbian. A more precise evalutation of the potential contubution achievable by PV panels located on a car (in almost horizontal position) is given bt the following graphs. 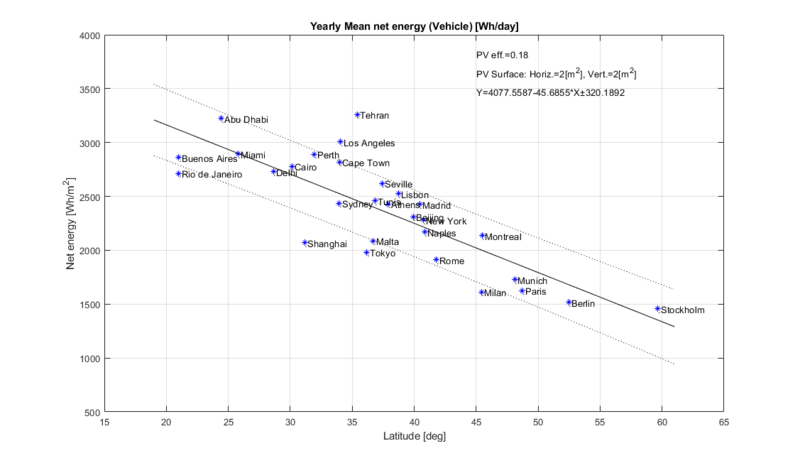 The values of mean and maximum daily net energy are computed for different cities at various latitudes by using the database PVWatts, developed by the NREL (National Renewable Energy Laboratory) of US. The data are obtained starting from the TMY (Typical Metereological Year), that takes into accout the mean real expected weather. It can be seen that, for a 2 sqm panel surface (compatible with our prototype and with most of cars) the maximum daily contribution can be over 3000 Wh/day in some locations, while mean contribution (considering also winter time) range from 1.000 to 2.000 Wh/day. The use of PV panels on lateral sides also results in a significant increase of energy harvesting. Average yearly daily contributions range from 2000 and 3000 Wh for most world locations, with maximum values exceeding 5000 Wh/day in some locations. These results have been obtained considering 2 m^2 of panels in horizontal position and 2 m^2 on vertical position, on car lateral sides. It is worth mentioning that the solar contribution presented above can be achieved if the PV panels are not shadowed. Shadowing (due to trees, tunnels, buildings and other obstacles) is more likely to occur during driving phases, while it can be avoided or minimized during parking with a proper choice of the parking slot. For most of cars used in typical urban commuting, that usually spend most of time when parked, the estimation presented above can be considered a reasonable approximation.